Friday afternoon showers brought thunder and lightning to Nova Scotia and briefly delayed firefighting efforts in the western part of the province as crews were removed from the forests for safety reasons because of the lightning. It was a change from the morning, when fog helped crews battling wildfires. However, air tankers were delayed by that fog, then forced back to Halifax due to the thunder and lightning, a release from the Department of Natural Resource said Friday afternoon. Five firefighters from P.E.I. 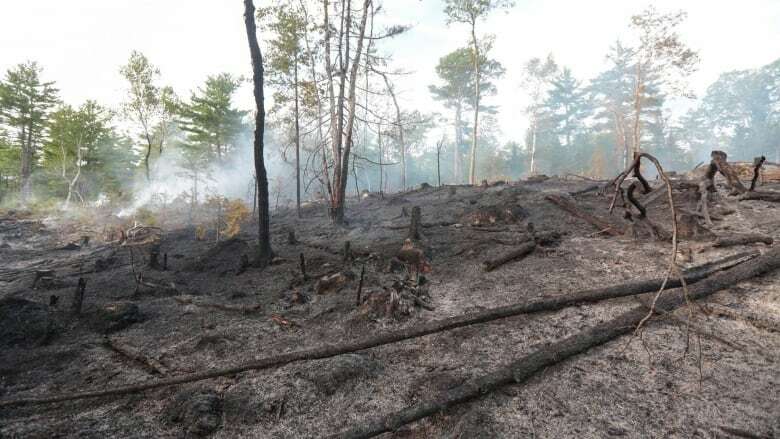 arrived Friday to help battle the wildfire at Seven Mile Lake, near Kejimkujik National Park, which spread overnight to 395 hectares from 377 hectares Thursday, the department said. It remains at 45 per cent containment. Smoke and humidity are creating breathing problems for some children and older people, or people with allergies, the province said. Environment Canada issued air-quality warnings for Pictou, Antigonish and Guysborough counties. It issued earlier issued air-quality warnings for Annapolis, Kings, Lunenburg and Queens counties. The province suggested staying inside, or heading to an air-conditioned place such as a library or mall, if you're having breathing troubles. Friday's weather forecast offered some hope that rain is on the way for the southwest region of the province which has experienced an unusually long dry spell. There's a 60 per cent chance of showers in the forecast for Friday afternoon, with winds out of the southwest at 15 kilometres an hour. Two vacant, seasonal cabins are under protection at the Seven Mile Lake fire site. The fire at Perch Lake, Pictou County, remains 100 per cent contained at about 10 hectares. The fire at Ten Mile Lake, Queens County, remains 100 per cent contained at about 8.3 hectares. Two spots of the fire expanded beyond the containment barrier in the afternoon, but were contained by air support. The fire at Maitland Bridge, Annapolis County, remains 100 per cent contained at about 21 hectares. The fire at Round Hill, Annapolis County, was declared out at noon Friday. Highway 8 remains closed due to active water bombing. Fires at Greenfield, Queens County, West Dalhousie, Annapolis County, and Clyde River, Shelburne County are now declared out. A ban on hiking and travelling in wooded areas of provincial parks remains in effect. Cape Breton Highlands National Park has now closed its back country and eastern trails until further notice. The closed trails include Middle Head, Franey, Clyburn Valley, Warren Lake, Jack Pine, Coastal Trail, Broad Cove Mountain, Aspy, Mica Hill, Jigging Cove, and Mary Ann Falls road. Warren Lake Beach remains open. There are also partial fire bans throughout the park. No open fires are currently permitted between 10 a.m. and 8 p.m.